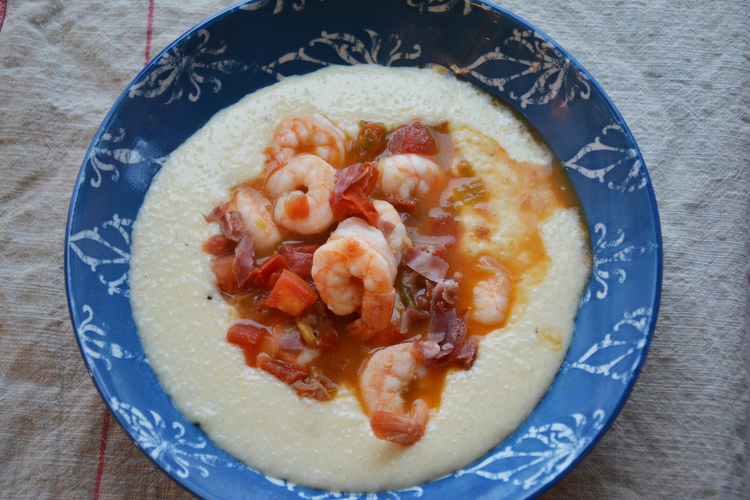 Shrimp and grits comes in many flavors. 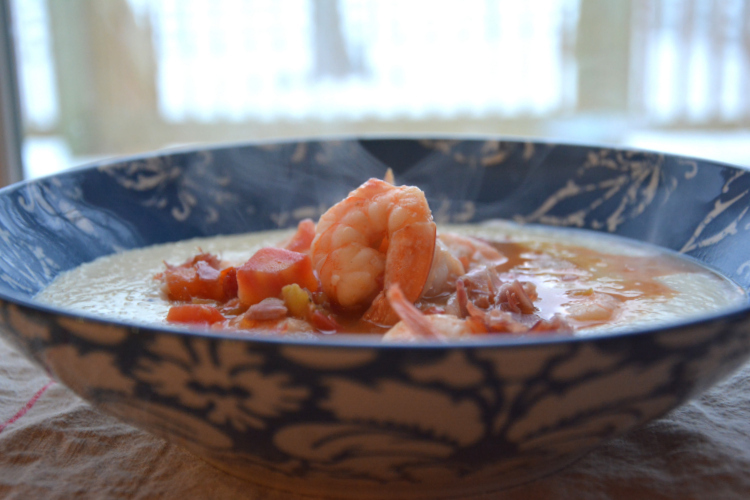 This version has a rich, creamy Gruyere grits base, topped with shrimp in a flavor packed sauce of green chiles, prosciutto and white wine. 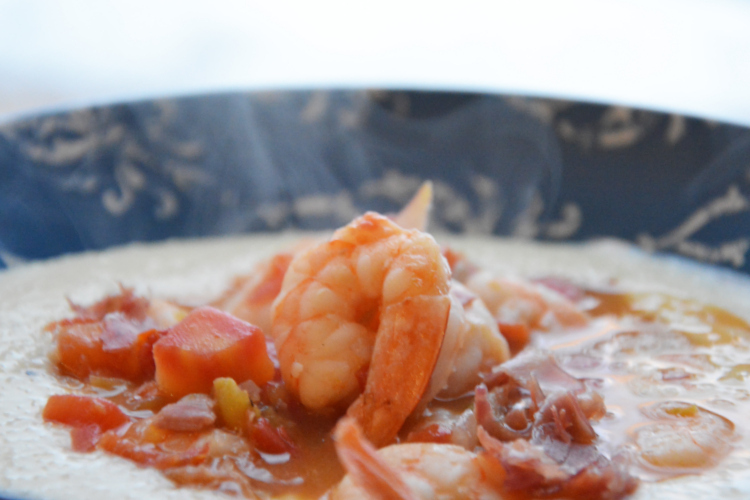 Shrimp and grits is a traditional southern breakfast dish from the lowcountry of Georgia and South Carolina. Recently, it has made a gradual spread throughout the country and now often appears on the menus of upscale restaurants in much the same way that lobster macaroni and cheese has. This happens to be one of my husband’s favorites, and was also a favorite of my late father-in-law. In honor of their New Mexico (as well as Georgia) roots, my version is infused with hatch green chiles. First, prepare the grits. Bring chicken stock, whipping cream, and butter to boil in heavy large saucepan or Dutch oven. Whisk in the grits and return to a boil, whisking continuously. Once the liquid boils again, lower the heat and simmer uncovered until the grits are thick, about 25 minutes. Add the cheese and stir well to incorporate. Add salt and pepper and allow to simmer over lowest heat, whisking as needed. Melt the butter in a large skillet over medium heat. Once the butter is melted, add the shallots and sauté until tender. Add the shrimp and sauté just until done - about 2-3 minutes. Do not overcook your shrimp or they will be tough. When the shrimp are done, transfer them to a glass bowl and set aside. Add 1/2 cup wine to the skillet and boil until reduced to a glaze. Add tomatoes, green chiles and prosciutto and cook until it is thickened. Add the shrimp back to the pan with the remaining 1/4 cup of wine and heat through. If the sauce is too chunky, you can add some of the reserved juice from the tomatoes and chiles. 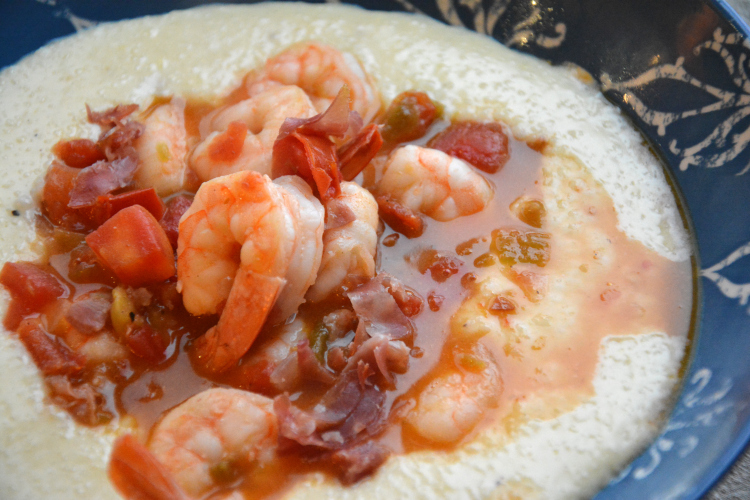 Spoon cheesy grits into bowl and top with shrimp and sauce. Serve immediately.